Another raucously funny entry in the genre of farce, Ken Ludwig’s 1995 Moon Over Buffalo, skewering behind the scenes theatre life and the colorful wackiness of actors, abounds with sight gags, pratfalls, and witty sitcom dialogue, delivering a laugh-out-loud treat. 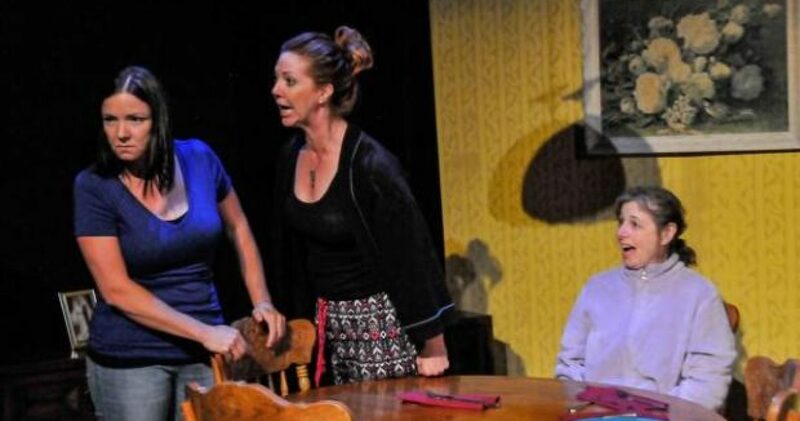 The current production at 6th Street Playhouse features seasoned, energetic actors with strong comedic skills who pull out all the stops to provide non-stop zaniness and laughter. It’s 1953, and box office stars George and Charlotte Hay (Dodds Delzell and Madeleine Ashe) try desperately to hold on to their fading glory, their budget, and their dignity as they slog through plays in repertory at middling theatre venues like Buffalo, New York. Actors are quitting because they haven’t been paid, and it’s getting harder for George to persuade Charlotte to continue the lackluster tour, especially when their company lawyer Richard (Joe Winkler) keeps trying to woo Charlotte away. The Hays’ daughter Rosalind (Chandler Parrott-Thomas) has already abandoned theatre in search of a normal life, but she shows up unexpectedly with weatherman fiancé Howard (Erik Weiss) in tow, hoping to introduce him to mom and dad at an opportune time. Her ex-fiancé Paul (Robert Nelson) still manages the company, and still carries a torch for Roz. . . .